Princess Adele struggles with a life of marriageand obligation as her Equatorian Empire and their American Republic alliesstand on the brink of war against the vampire clans of the north. However, thealliance’s horrific strategy for total victory drives Adele to abandon her dutyand embark on a desperate quest to keep her nation from staining its hands withgenocide. Reunited with her great love, the mysterious adventurer known to theworld as the Greyfriar, Adele is pursued by her own people as well as hervengeful husband, senator Clark. With the human alliance in disarrray, PrinceCesare, lord of the British vampire clan, seizes the initiative and strikes atthe very heart of Equatoria. As Adele labors to bring order to her world, she learns more about the strangepowers she exhibited in the north. Her teacher, Mamoru, leads a secret cabal ofgeomancers who believe Adele is the one who can touch the vast power of theEarth that surges through ley lines and wells up at the rifts where the linesmeet. These energies are the key to defeating the enemy of mankind, and ifPrincess Adele could ever bring this power under her command, she could bedeath to vampires. But such a victory will also cost the life of Adele’sbeloved Greyfriar. The Rift Walkeris the second book in a trilogy of high adventure andalternative history. 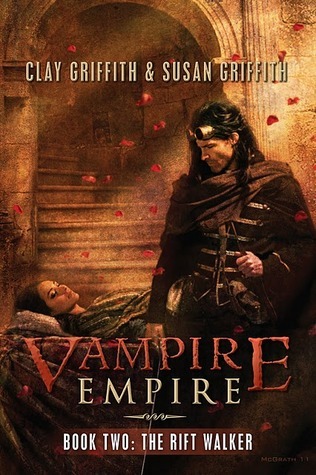 Combining rousing pulp action with steampunk style, theVampire Empire series brings epic politcal themes to life within a story ofheartbreaking romance, sacrifice, and heroism. Thanksto Pyr for sending me a copy of this book to review. Clayand Susan Griffith made quite an impression with their novel The Greyfriar, which is the first bookin the Vampire Empire trilogy. The Greyfriar was a fun adventure whichseamlessly blended alternative history, steampunk and a sort of urban fantasyfeel into something new and unusual that readers loved. The question remained,however, as to whether they could pull it off a second time for the second bookin the Vampire Empire trilogy. Thesecond book in trilogies usually leaves me a little frustrated. They tend tofeel more like bridges between the start and end rather than actual booksthemselves. Second books are the books where things seem to happen, but almostnothing resolves. It’s the book that builds the crescendo for readers to bewowed by book three. Thus, I usually go into them a little skeptical and alittle jaded. The blessed thing with TheRift Walker is that my jaded and skeptical feelings never amounted toanything. This second book is different from most others out there. It’s notjust a bridge serving its function to get from the start of the series to the finish. WhereThe Greyfriar took place in the coldnorth, The Rift Walker takes place inEquatoria. The Griffith team reallyexpand on the world and cultures inhabiting the world in The Rift Walker. Rather than doing this by using infodumps, theytake the reader through Alexandria, Cairo and other exotic places to experiencethe new cultures, peoples and struggles with their own eyes. Furthermore, thefunction of the government and empire itself is far less mysterious in The Rift Walker. The empire itselfbecomes understandable, real and interesting where before it was moremysterious – an important aspect of the world but wasn’t incredibly tangible. Itshould stand to reason that this book seems to focus more on Adele and herworld rather than the Greyfriar and his. However, the cast and charactersexpand just like the world. Plans and plots are made known. Questions areanswered while more are asked. Each character seems to get their own time inthe limelight and they do marvelously with it. However, it truly is Adele thatshines. She’s well rounded, interesting and more adult than she was in The Greyfriar. Furthermore, theGriffith’s do a wonderful job highlighting Adele’s inner struggles withlearning more about who she is and her place in the world, as well as her outerones which involve her impending marriage and various other issues surroundingher position as heir apparent to an impressive empire. The Rift Walker is nonstop action fromthe first page. While much of this is incredibly predictable, it doesn’tdetract from the fun of the work as a whole. In fact, the overall fun andadventurous tone and the incredibly expanded world seem to make anypredictability a nonissue. There is something here for everyone, fromtreachery, to political maneuvering, romance and even darker moments. The Rift Walker is well rounded andnicely balanced with a more vibrant and well-rounded world than itspredecessor. Allin all, The Rift Walker is a strongaddition to the Vampire Empiretrilogy and is, far and away, stronger than it’s predecessor, The Greyfriar. This book stands out inthe fact that it’s not like most other middle-of-a-trilogy books. The Rift Walker expands on the world andcharacters. The plot speeds forward at a breakneck pace. The characters are engaging,realistic and expanded upon just like the world. The writing is fluid andvisual. If the book is a bit predictable, all the other elements work togetherto make the predictability a nonissue. TheRift Walker is fairly self-contained; yet open enough to allow a strongthird and final installment to the series. This is a book fans of the seriesshould watch out for. They won’t be disappointed. Still need to read the first one, I'm thinking late this month or early next month.